Pangaea or Pangea (derived from Παγγαία, Greek meaning "all earth") is the name given to the supercontinent that is thought to have existed during the Paleozoic and Mesozoic eras, before the process of plate tectonics separated each of the component continents into their current configuration. Pangaea broke apart during the Triassic and Jurassic periods of the Mesozoic, separating into Laurasia and Gondwana (or Gondwanaland). While the concept of Pangaea, and the theory of plate tectonics in general, poses a problem for young-earth creationists, who hold that the Earth is but thousands of years old, the science is supported by a wealth of geographical, paleontological, and geological evidences and is widely accepted. 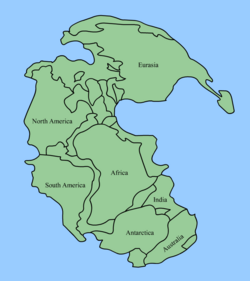 The name Pangaea was apparently first used in 1920 by the German Alfred Wegener, the "father of the theory of continental drift." Wegener proposed the idea of a supercontinent in 1915 in his book The Origin of Continents and Oceans (Die Entstehung der Kontinente und Ozeane, although according to the OED, 2d edition (1989), the word is not found in the 1915 edition of Wegener's text; it appears in the 1920 edition but with no indication that Wegener is coining it. In configuration, Pangaea is believed to have been a C-shaped landmass that spread across the equator. The body of water that was believed to have been enclosed within the resulting crescent on the East side has been named the Tethys Sea. Owing to Pangaea's massive size, the inland regions appear to have been very dry, due to the lack of precipitation. The large supercontinent would potentially have allowed terrestrial animals to migrate freely all the way from the South Pole to the North Pole. The vast ocean that once surrounded the supercontinent of Pangaea has been named Panthalassa. Pangaea is believed to have broken up about 180 million years ago (mya) in the Jurassic period, first into two supercontinents (Gondwana to the south and Laurasia to the north), and thereafter into the continents as they are observed today. Plate tectonics is a theory of geology which was developed to explain the observed evidence for large scale motions within the Earth's crust, such as the formation and breakup of Pangaea, leading to the current configuration of continents. The theory encompassed and superseded the older theory of continental drift from the first half of the twentieth century and the concept of sea floor spreading developed during the 1960s. Essentially, this theory recognizes a thin, solid crust, made up of several plates, that floats or rides on an inner layer of melted rock. Specifically, the outermost part of the Earth's interior is made up of two layers: Above is the lithosphere, comprising the crust and the rigid uppermost part of the Earth's mantle. Below the lithosphere lies the asthenosphere, which is a more viscous zone of the mantle. Although solid, the asthenosphere has very low shear strength and can flow like a liquid on geological time scales. The deeper mantle below the asthenosphere is more rigid again. The lithosphere essentially "floats" on the asthenosphere. The lithosphere has broken up into what are called "tectonic plates"—in the case of Earth, there are ten major and many minor plates. These plates move in relation to one another. The lateral movement of the plates is typically at speeds of several centimeters per year. Pangaea was not the first supercontinent believed to have existed. From the evidence available, scientists have reconstructed a predecessor, termed Pannotia, that may have formed about 600 mya, before dividing again some 50 million years later. Another, earlier hypothesized supercontinent is Rodinia, believed to have formed approximately 1,100 mya and divided 750 mya. Tentative evidence suggests that the Columbia (supercontinent) existed between 1.8 and 1.5 billion years ago. There is also some evidence for an even earlier supercontinent named Kenorland, existing between ~2.7 billion years to ~2.1 billion years ago, and Earth's possibly first supercontinent named Vaalbara, existing between ~3.3 billion years to ~2.8 billion years ago. Rodinia, believed to have formed 1.1 billion years ago during the Proterozoic, was the supercontinent from which all subsequent continents, sub or super, derived. The hypothesized supercontinent Gondwana is believed to have been involved in the formation of Pangaea. Gondwana (also called Gondwanaland) had several iterations, existed before Pangaea formed and remained intact after Pangaea broke up. One simplified version holds that that Pangaea formed as a result of the collision of Gondwana and Laurasia (a supercontinent that also existed before and after Pangaea), while Laurasia was formed by the collision during the Carboniferous of the Siberia continent and the minor supercontinent Laurussia (or Euramerica). After these three major landmasses collided, during the Carboniferous, roughly 350 mya, other smaller landmasses collided as well. The following is a detailed hypothesis for the formation of Pangaea. Before Pangaea formed, the minor supercontinent of Proto-Laurasia drifted away from Gondwana and moved across the Panthalassic Ocean. A new ocean was forming between the two continents: The Proto-Tethys Ocean. Soon, Proto-Laurasia split apart itself to create Laurentia, Siberia (as a continent), and Baltica. The rifting also spawned two new oceans, the Iapetus and Khanty Oceans. Baltica remained east of Laurentia, and Siberia sat northeast of Laurentia. In the Cambrian, the independent continent of Laurentia (on what would become North America) sat on the equator, with three bordering oceans of Panthalassic Ocean to the north and west, Iapetus Ocean to the south, and Khanty Ocean to the east. In the Earliest Ordovician, the microcontinent of Avalonia, a landmass that would become the northeastern United States, Nova Scotia, and England, broke free from Gondwana and began its journey to Laurentia. Baltica collided with Laurentia by the end of Ordovician, and northern Avalonia collided with Baltica and Laurentia. Laurentia, Baltica, and Avalonia formed to create a minor supercontinent of Euramerica or Laurussia, closing the Iapetus Ocean, while the Rheic Ocean expanded in the southern coast of Avalonia. The collision also resulted in the formation of the Northern Appalachians. Siberia sat near Euramerica, with Khanty Ocean between the two continents. While all this was happening, Gondwana drifted slowly towards the South Pole. This was the first step in the formation of Pangaea. The second step in the formation of Pangaea was the collision of Gondwana with Euramerica. By Silurian time, Baltica had already collided with Laurentia to form Euramerica. Avalonia had not collided with Laurentia yet, and the seaway between them, a remnant of Iapetus Ocean, was still shrinking as Avalonia slowly inched towards Laurentia. Meanwhile, southern Europe fragmented from Gondwana and started to head towards Euramerica across the newly formed Rheic Ocean, and collided with southern Baltica in the Devonian. But this microcontinent was an underwater plate. Iapetus Ocean's sister ocean, Khanty Ocean, was also shrinking as an island arc from Siberia collided with eastern Baltica (now part of Euramerica). Behind this island arc was a new ocean, the Ural Ocean. By late Silurian time, North China (continent) and South China (continent) rifted away from Gondwana and started to head northward across the shrinking Proto-Tethys Ocean, and on its southern end, the new ocean, Paleo-Tethys Ocean, opened. In the Devonian period, Gondwana itself headed towards Euramerica, causing the Rheic Ocean to shrink. In the Early Carboniferous, northwest Africa had touched the southeastern coast of Euramerica, creating the southern portion of the Appalachian Mountains, and the Meseta Mountains. South America moved northward to southern Euramerica, while the eastern portion of Gondwana (India, Antarctica, and Australia) headed towards the South Pole. North China and South China were on independent continents. Kazakhstania microcontinent had collided with Siberia. (Siberian continent has been a separate continent for millions of years since the deformation of the supercontinent Pannotia) in the Middle Carboniferous. Western Kazakhstania collided with Baltica in the Late Carboniferous, closing the Ural Ocean between them, causing the formation of the Ural Mountains, and the formation of the supercontinent of Laurasia. This was the last step of the formation of Pangaea. Meanwhile, South America had collided with southern Laurentia, closing the Rheic Ocean, and forming the southernmost part of the Appalachians and Ouachita Mountains. By this time, Gondwana was positioned near the South Pole, and glaciers were forming in Antarctica, India, Australia, and southern Africa and South America. The North China block collided with Siberia by Late Carboniferous time, completely closing the Proto-Tethys Ocean. By Early Permian time, the Cimmerian plate rifted away from Gondwana and headed towards Laurasia, forming on its southern end the new Tethys Ocean, and closing the Paleo-Tethys Ocean. Most of the landmasses were all in one. By the Triassic Period, Pangaea rotated a little, towards the southwest direction. The Cimmerian Plate was still traveling across the shrinking Paleo-Tethys, until the Middle Jurassic time. Paleo-Tethys had closed from west to east, creating the Cimmerian Orogeny. Pangaea looked like a "C," with an ocean inside the "C," the new Tethys Ocean. But Pangaea rifted by the Middle Jurassic, and its deformation is explained below. There were three major phases hypothesized in the break-up of Pangaea. The first phase began in the Early-Middle Jurassic, when Pangaea created a rift from the Tethys Ocean from the east and the Pacific from the west. The rifting took place between North America and Africa. The rift produced multiple failed rifts, the Mississippi River being the largest. The rift resulted in a new ocean, the Atlantic Ocean. The Atlantic Ocean did not open uniformly; rifting began in the North-Central Atlantic. The South Atlantic did not open until the Cretaceous. Laurasia started to rotate clockwise and moved northward, with North America to the north, and Eurasia to the south. The clockwise motion of Laurasia also lead to the closing of the Tethys Ocean. Meanwhile, on the other side of Africa, new rifts were also forming along the adjacent margins of east Africa, Antarctica, and Madagascar that would lead to the formation of the Southwest Indian Ocean that would also open up in the Cretaceous. The second, major phase in the break-up of Pangaea began in the Early Cretaceous (150-140 million years ago), when the minor supercontinent of Gondwana separated into four multiple continents (Africa, South America, India, and Antarctica/Australia). About 200 million years ago, the continent of Cimmeria, as mentioned above, collided with Eurasia. However, a subduction zone was forming, as soon as Cimmeria collided. This subduction zone was called the Tethyan Trench. This trench might have subducted what is called the Tethyan mid-ocean ridge, a ridge responsible for the Tethys Ocean's expansion. It probably caused Africa, India, and Australia to move northward. In the Early Cretaceous, Atlantica, today's South America and Africa, finally separated from Eastern Gondwana (Antarctica, India, and Australia), causing the opening of a "South Indian Ocean." In the middle Cretaceous, Gondwana fragmented to open up the South Atlantic Ocean as South America started to move westward away from Africa. The South Atlantic did not develop uniformly, rather it rifted from south to north like a zipper. Also, at the same time, Madagascar and India began to separate from Antarctica and move northward, opening up the Indian Ocean. Madagascar and India separated from each other 100-90 million years ago in the Late Cretaceous. India continued to move northward toward Eurasia at 15 centimeters per year (a plate tectonic record), closing the Tethys Ocean, while Madagascar stopped and became locked to the African Plate. New Zealand and New Caledonia began to move from Australia in an eastward direction towards the Pacific, opening the Coral Sea and Tasman Sea. They have been independent islands since. The third major and final phase of the break-up of Pangaea occurred in the early Cenozoic (Paleocene to Oligocene). North America/Greenland broke free from Eurasia, opening the Norwegian Sea about 60-55 million years ago. The Atlantic and Indian Oceans continued to expand, closing the Tethys Ocean. Meanwhile, Australia split from Antarctica and moved rapidly northward—just as India did more than 40 million years earlier—and is on a collision course with Eastern Asia. Both Australia and India are currently moving in a northeast direction at 5-6 cm/year. Antarctica has been near or at the South Pole since the formation of Pangaea (since about 280 mya). India started to collide with Asia beginning about 35 million years ago, forming the Himalayan orogeny, and also finally closing the Tethys Seaway; this collision continues today. The African Plate started to change directions, from west to northwest toward Europe, and South America began to move in a northward direction separating itself from Antarctica, allowing complete oceanic circulation around Antarctica for the first time, causing a rapid cooling of the continent and allowing glaciers to form. Other major events took place during the Cenozoic, including the opening of the Gulf of California, the uplift of the Alps, and the opening of the Sea of Japan. The break-up of Pangaea continues today in the East Africa Rift; ongoing collisions may indicate the creation of a new supercontinent. Torsvik, T. H. 2003. The Rodina Jigsaw Puzzle. Science 300(5624):1379-1381. This page was last modified on 18 June 2013, at 23:12.